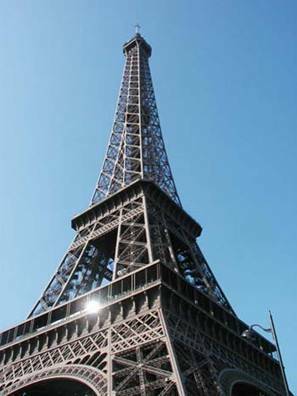 The Eiffel Tower on Sunday afternoon. Movie shoot happening at the Square Pablo Casals. 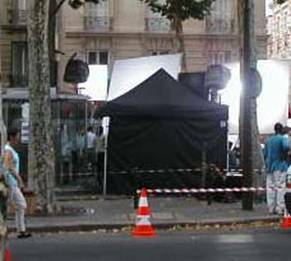 Lights, but not much action, at the movie shoot. As I took the photo at left on Sunday, there were two armed soldiers standing near me. Armed soldiers are now seen near all the important tourist spots and in the train station. They are probably in the airport, too. All the people who go into Notre Dame have their bags checked. There have been lots of temporary closures of métro stations due to suspicious packages, all of which so far have been harmless. Fortunately, we are working hard every day and do not need to use the métro. In the evening, we just go to places that we can walk to. Paris is on high alert, that is clear. The evening after I took this photo, Tom and I went walking on the Champ de Mars after dinner. I wish I’d had the camera then. The sun was setting (10PM), the sky was rose, and the tower started its hourly ten minutes of sparkling lights. The Champ was full of people lounging in the grass, socializing, taking in the gorgeous evening. The moment the tower started sparkling, a great collective “ah” was uttered by the hundreds or thousands lounging about in anticipation of this hourly show. Last night we had a very nice dinner with friends at Le Tire Bouchon. The dinner was flawless. Le Tire Bouchon moves back up to the top of my list. Alan told us about what was apparently going to be a movie shoot being set up at the end of our street. After dinner, we walked up there. There were lots of big, shiny trucks, but no action. So this morning when I went out to get the paper, I went up there (actually to the Square Pablo Casals) to see what was happening. There was indeed a movie shoot happening. It was actually pretty boring. It must take forever to make a movie. No wonder ticket and DVD prices are so high. Alan and I had been wondering if it might be more Da Vinci Code filming (as happened last week or so at the Louvre and someplace else in Paris). But I didn’t see Tom Hanks or anyone that I could recognize. Who knows. But there sure was a lot of equipment and many large trucks. Meanwhile, I have been reading fascinating news about the London bombings investigation in Le Parisien, and it is news that does not seem to appear in the English newspapers, or even in Le Monde or Le Figaro, or on the internet – unless I’m missing something. So, in case you haven’t heard this, I’ll tell you what Le Parisien reported yesterday and today. First of all, in yesterday’s edition, Le Parisien’s London correspondent reports that the London bombers could have been duped, and that they may not have intended to die in the bombings themselves. Supposedly several newspapers (which I have not seen), over the weekend, reported that special investigators do not understand why the bombers left so much proof of their identity to be found. I guess suicide bombers usually do not carry their wallets with all their identification on them, as these terrorists evidently did. Most suicide bombers, the investigators say, wear their bombs on their bodies, but these guys had the bombs in backpacks that they could readily remove from their bodies. And finally, most suicide bombers of the fanatical Islamic ilk cry out “Allah akbar” before exploding, and these bombers did not do that. So, we are left with the possibility that the bomb makers led these four to believe they would have some time to get away before the explosion occurred. If that is true, this information should be disseminated all over the place so that young men will not trust those who are recruiting them to be terrorists. Today’s issue of Le Parisien reports that the bombs included metallic containers of expensive perfumes, like the one at left (the Rive Gauche perfume that I’ve been buying and using for over ten years). Evidently, one of the bombers, Jermaine Lindsay aka Abdullah Shaheed Jamal, bought 1500 euros worth of these perfumes in the days or weeks before the attacks. His bank was suspicious about his purchases, so they hired a private investigation firm, Hogan and Company, to look into them. The investigators found that Lindsay had gone to the Fragrance Shop twice and spent 503 euros each time on the perfumes. What brands? Dior’s Fahrenheit, Jean-Paul Gaultier, Boss, Armani. Then he spent another 460 euros in another Fragrance Shop location. There, he was agitated because he absolutely had to have a perfume by Hugo Boss, and the shop didn’t have it. So he went back to the first Fragrance Shop the next day to buy the Hugo Boss perfume. Then he also bought a large amount of perfume at Woolworths, 20 some meters away from the Fragrance Shop (in Aylesbury). At any rate, the private investigators reported the suspicious perfume purchases to Scotland Yard days before the attacks. Scotland Yard is refusing to confirm or deny this. The metallic perfume containers were placed all around the explosive charges in the backpacks. When the explosion occurred, the metal became shrapnel, and the alcohol in the perfumes caught on fire, making the burns people received much worse. That is certainly not angelic behavior. I believe that God is good and loving, even to nonbelievers, and I always will.